Because of their intuitive nature, Pisces often knows the best way to handle a difficult situation. 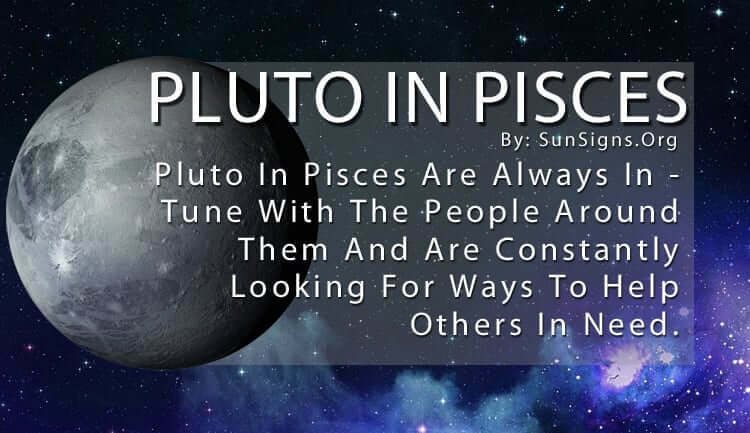 That’s why Pluto in Pisces is so in-tune with the people around them. They know how they’re feeling and can empathize with them. They are constantly looking for ways to help others in need. Pluto represents regeneration, spirituality, discovery, rebirth, and power. As part of this, Pluto includes the quest for truth and getting to know the deeper meaning of issues. Being a dreamer makes Pluto in Pisces imagine a wonderful world where everyone is open and honest and respects each other. Unfortunately, reality doesn’t work out that way, causing there to be a disconnect between their hope and their attitude toward the way they feel the world should be. (Know the Pisces man better). But what Pluto in Pisces zodiac sign lacks in common sense they more than makeup for with inspirational thoughts and deeds. They wear their emotions on their sleeves and have no poker face when it comes to their excitement or disappointment in something. But when they are enthusiastic, their fervor is infectious and can get other people up and moving. Their tireless efforts can start movements if they are passionate enough about a social issue. Find out what your power sign represents. They often help others down the path of spiritual growth and enlightenment with their own inspiring actions. Luckily, Pluto in Pisces is able to go with the flow and even embrace change, especially if it means shifting something from bad to good. They are incredibly kind and caring and will help anyone who asks them for it. While this looks like a good thing, it can sometimes backfire on Pisces Pluto sign if they aren’t careful. There are plenty of people ready to take advantage of them at the drop of a hat. They tend to let people walk all over them so they can appear to be the martyr in any scenario. But Pluto in Pisces also can be more passive aggressive when trying to get what they want, which means they can be manipulative at times. This is the only time they ever make a power play. When they are struggling to achieve something for the greater good. But this desire for control is never executed in a malicious manner. They simply want things to go their way so they don’t disappoint those who are counting on them. Pluto in Pisces is very sensitive and it’s important to them that they don’t let anyone down. They so desperately want to help people that they sometimes sacrifice their own health and well-being. The only thing the Pluto in Pisces people have to be cautious of is letting their failures take control of their emotions. Because they are so obsessed with fantasy, they often forget to take care of the daily responsibilities that everyone else deals with on a regular basis. This makes them feel inadequate sometimes, and if they allow that feeling to spiral out of control they can easily become depressed. And since their natural inclination is to escape from reality, they can easily turn to drugs or alcohol. That’s why it’s imperative for their large social circle to keep an eye on them and keep them optimistic and motivated. Bringing them back to reality can be difficult, but it is necessary to ensure they stay on the lighter side of things. Pisces Pluto astrology predicts that they have a lot of good to achieve in their lifetime! Previous 8 Ways To Find Out If She Is Mrs. Right?